Two brother and sister Walker Hounds, Skipper and Mattie, were adopted from the Richmond, VA SPCA in April 2003. Skipper (shown above in the blue collar) suffered an FCE (fibrocartilaginous embolism) in 2007 and was paralyzed from the neck down. He was taken to North Carolina State University’s Veterinary Hospital and the Animal Rehabilitation & Wellness Institute in Cary, where he fully recovered and learned how to stand and walk again. Sadly, he died of bloat November 15, 2010 and Mattie passed away from heart failure in 2014. 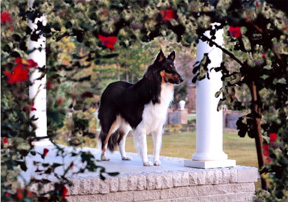 In January 2009, p.m.terrell learned of a collie (shown above) who had been terribly abused and had been rescued by the Robeson County Humane Society. She should have weighed 65 pounds but weighed only 40, she had just given birth, and she was so physically and emotionally traumatized that it was uncertain whether she could recover. The terrells originally took her in as a foster, but the entire family fell in love with Simone and adopted her. She is now fully recovered and is a vital part of the family. 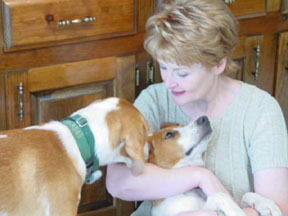 Then in December 2009, the terrells learned of a Jack Russell at the Robeson County Humane Society who had been shot in the leg. He still had shrapnel in his leg, and the shot had knocked the ball out of the socket and splintered the bone. The terrells adopted Eddie and took him to a surgeon in Cary, North Carolina. He now has a metal plate in his leg but has fully recovered. He has more energy than the other dogs combined, as shown in the video above. 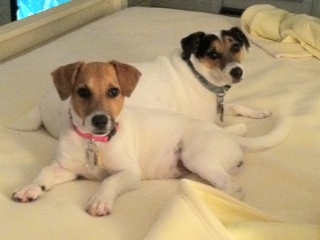 As if three dogs weren’t enough at one time, she adopted another Jack Russell mix in 2012. Her name is Lucy Lou (shown above with the pink collar; Eddie is wearing the blue collar) and she has endeared herself to the entire family. She also was adopted through the Robeson County Humane Society, giving her the distinction of having adopted more pets from them than anyone else. p.m.terrell also helped to start the New Leash on Life program at Robeson County’s Correctional Facility in North Carolina. The idea is to rescue dogs destined for euthanasia and which are difficult to place, such as large or untrained dogs. The dogs are paired with inmates, who teach them how to sit, stay, down, come and heel, as well as more advanced agility training or tricks, using only the praise method (no punishment allowed.) Terrell trained the first six groups of inmates and dogs. 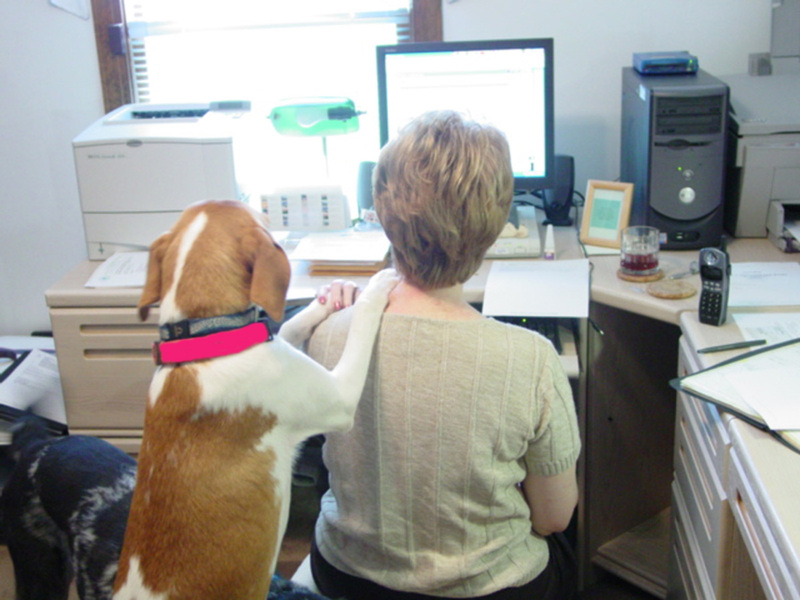 100% of the dogs she helped to train were adopted by loving families upon graduation. The New Leash on Life program was discontinued when the prison was shut down.